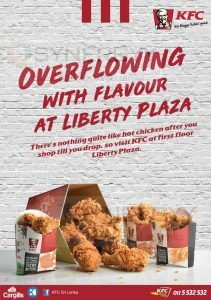 KFC Sri Lanka open up a new KFC outlet at first floor,Liberty Plaza. enjoy your shopping till you drop and enjoy a hot chicken afterwards. 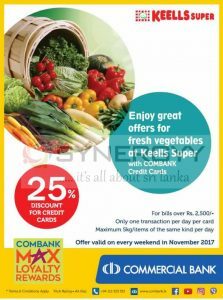 Cargills open up a new experience of food hall at newly open Colombo City Centre shopping mall, Cargills food hall comes as a range of service providers other than their retails services. 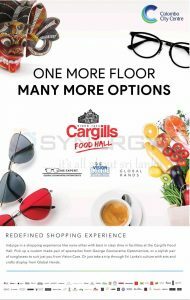 Indulge in a shopping experience like none other with best in class dine in facilities at the Cargills Food Hall. Pick up a custom made pair of spectacles from George Gooneratne Optometrists, or a stylish pair of sunglasses to suit just you from Vision Care. 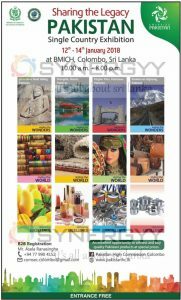 Or just take a trip through Sri Lanka’s culture with arts and crafts display from Global Hands. 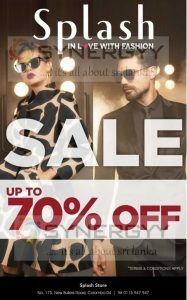 Splash announces discount upto 70% for range of clothing available at Splash Store, No. 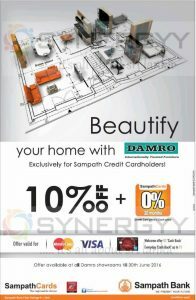 175 New Bullers Road, Colombo 04. Splash is an international clothing franchise with good casual and party wear. 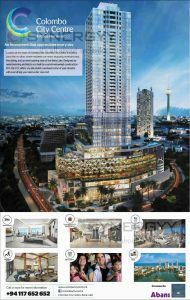 The price are bit high and showrooms similar to ODEL and Perl of Asia. 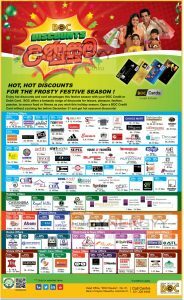 Currently Splash has 2 outlets one at Colombo 4 as above and other one at K-Zone ja-Ela. 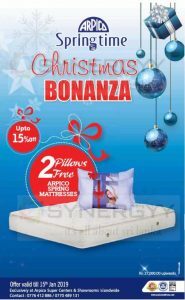 See below image for promotion. 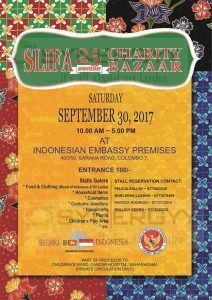 Pakistan High Commission of Colombo organise an exhibition of Sharing the Legacy Pakistan – Single Country Exhibition from 12th to 14th January 2018 at BMICH, Colombo, Sri Lanka from 10.00 a.m. – 8.00 p.m.
Sri Lanka Indonesia Friendship Association organised a 25th Anniversary Charity Bazaar on 30th September 2017 on Saturday from 10.00 Am to 5.00 Pm at Indonesian Embassy Premises. Visit to the Indonesian Embassy and enjoy the Stalls Galore of below and enjoy the hospitality of Indonesians. 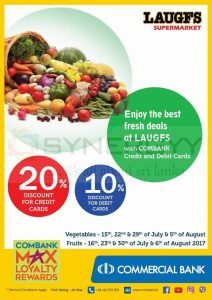 Offer valid on 3, 10, 17 and 24 June 2017. 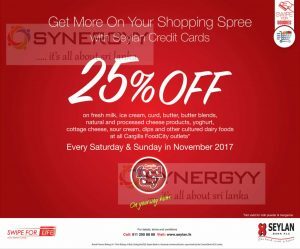 Use your Nations Trust Bank American Express® Card and receive amazing savings at all your favourite stores. 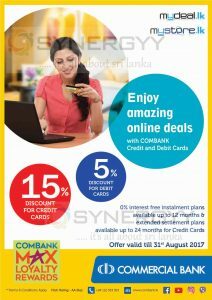 See below image for more detail about the latest promotions available for American Express Credit cards. Withdraw up to 50% of your credit limit from any ATM and convert the transaction into an interest-free instalment plan of up to 12 months with no handling fee. 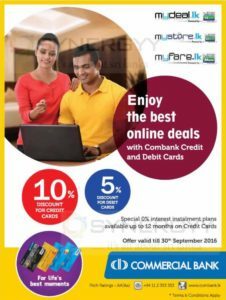 To convert the transaction into a 0% interest instalment plan,Type AMEX (space) NIC (space) amount & SMS to 011 4 682 767. 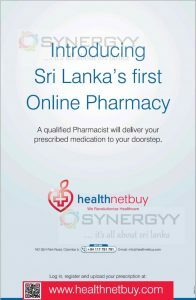 Introducing Sri Lanka’s first Online Pharmacy of www.Healthnetbuy.com; it’s a revolutionary development in Sri Lanka to focus more into technological advancement in each and every industry. 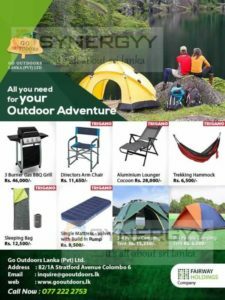 The www.Healthnetbuy.com offers you convenience shopping of needed medicine and a qualified Pharmacist will deliver your prescribed medication to your doorstep. 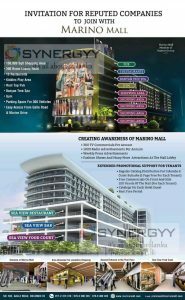 Print Cornet at Majestic City brought you range of printing services at an affordable price in market. 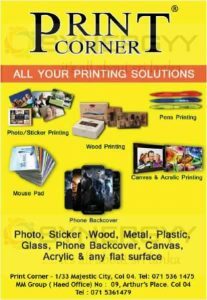 And print corner do Photo, Sticker, Wood, Metal, Plastic, Glass, Phone Backcover, Canvas, Acrylic & any flat surface. 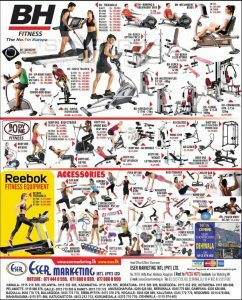 ESER Marketing a leading fitness equipments importers and distributors in islandwide with an affordable price. ESER Marketing offers range of below Fitness Equipments for your healthily life. 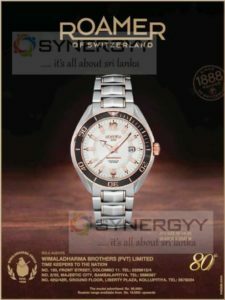 Wimaladharma Brothers brought you Roamer of Switzerland Searock 20 ATM. Swiss-made quality watches have been ROAMER’s distinctive trademark ever since the company’s founding in 1888. Each facet of the Swiss watch brand epitomises quality: design and engineering, choice of suppliers and materials, production and services for customers and partners. The precise Swiss movements that animate ROAMER’s watches embody uncompromising meticulousness, while carefully selected compositions of long-lasting materials in harmonious shapes express sensitivity and a timelessly enduring character. Every ROAMER wristwatch conveys a sensual feeling of freedom and can accompany its owner as a reliable timepiece on all occasions, ably serving its functions and adding another dimension to each precious moment in life: QUALITY TIME. The story of ROAMER, the brand of high-quality Swiss watches, begins with the ideal of its pioneering founder, Fritz Meyer (1859-1926), to create a robust yet elegant watch, a precious accessory which everyone would love to own. With this goal, he sets up his own business in Solothurn, Switzerland – a workshop with six employees producing cylinder escapements for the watch industry. 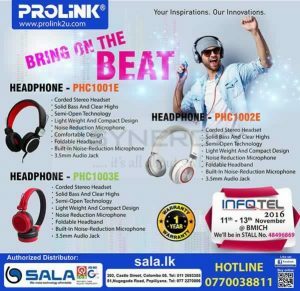 The below advertised Roamer watch on 99,500/- and roamer range available from Rs. 19,500/- upwards. 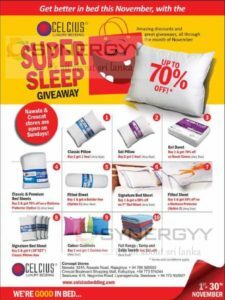 Celcius Luxury Bedding is a trustiest brand name for comfort bedding requirements of pillows, duvet, bed sheet, flitted sheet, cushions and towels at a special price with discount upto 70%. 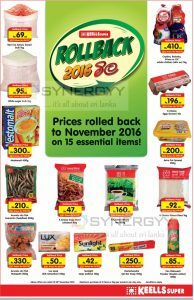 These offers valid from 1st to 30th November 2016 for more details see below table. 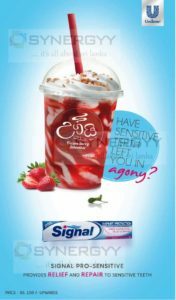 Signal has introduce a new product of Signal Pro-sensitive specially for those who felt Senstive teeth and feel annoying while having cool or hot foods and drinks. 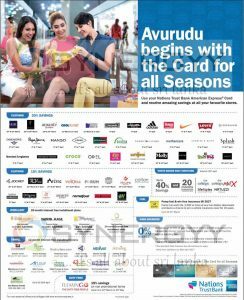 Adidas Sri Lanka showroom brought you a special 40% off on all Adidas Products at their Pelawatte and Majestic City outlet, this promotion run till stock last. 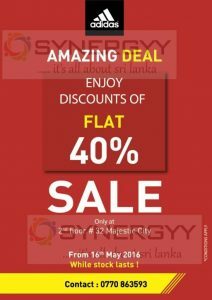 It’s an amazing promotion for those who looking forward a high quality sports clothing and causal wears at a reasonable price. 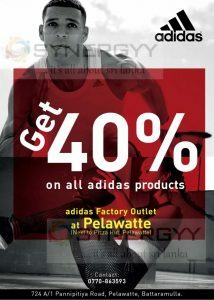 You may not see another offer like 40% off on all Adidas or other branded clothing products anywhere els in Sri Lanka.